Mackinaw Parasailing is one of many great places and tourist attractions in Mackinaw City, MI. Imagine experiencing the sights and sounds of Mackinaw with a bird's eye view, flying gracefully over the waters of Lake Huron as you ascend into a luminous azure sky. Or stop imagining and take your summer vacation to new heights with Mackinaw Parasailing. If you are an extreme sports enthusiast looking for a highflying adventure on your next vacation, then let Mackinaw Parasailing be your guide. Mackinaw Parasailing is fully licensed and insured, and has been operating out of Mackinaw City for the past six years with a very dedicated and experienced cast and crew. You will enjoy a very smooth and comfortable ride thanks to a custom parasailing boat and specialized parasailing equipment that enables the parasailer to take off and land directly from the flight deck, making for a dry parasailing adventure as well! Michigan Parasailing offers single and tandem flights and enough seating for six so your friends can be a part of your parasailing adventure. Commemorate the event with souvenir t-shirts and caps and don't miss out on their offer for on board photos and video service. Capture your gravity-defying feat on videotape so you can watch it over and over again in the safety of your own home. Attempt flying heights of up to 600 ft in the air, or play it safe at 150 ft. Mackinaw Parasailing prices range according to the height you wish to attempt and also vary for a single flyer versus a tandem or double flyer. Observation passengers are $10.00 per each departure. Mackinaw Parasailing is open seven days a week from 9am to 9pm, starting on Memorial Day and running through Labor Day. For more information on parasailing, feel free to visit them on their website www.mackinawparasailing.com. 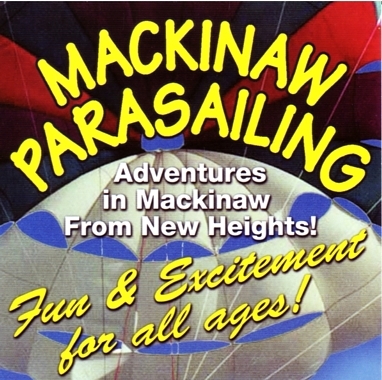 Virtual brochure and information for Mackinaw Parasailing, one of many online travel brochures for tourist information in Mackinaw City, MI. Provided by your source for Mackinaw Information and Mackinac Information. "Yellow Box Car at Star Line's Railroad Dock"
Group Outings! Have Parasailing at your next big function! Adventures in Mackinaw From New Heights! Fun & Excitement for all ages! Relax & Enjoy! Parasailing in Mackinaw - A great way to see it All! The captains and the crew welcome you aboard to ride the wind under our parasails. You will enjoy a bird's eye view in a peaceful and serene world. The ride is breathtaking and thoroughly enjoyable. You will take off and land from the deck of the boat, never having to get wet unless you want to. Fun and excitement awaits you! Double the Fun - Fly Together! While you do the flying, use our digital video and photo services to capture the moment. Also available disposable cameras and T-shirts. All flights are 10-12 minutes long. Your choice of 300 or 600 feet. My family and I went parasailing, this last week 6/25/2012. We could not have had a better time, we were treated great, and the crew did a great job, they were friendly and professional. I would recommend this outfit to anyone. We are looking forward to the next time. Was a great experience from booking till the end of the ride. Very courteous staff. Made myself and my 6 year old daughter very comfortable and secure. Kudos to mackinaw parasailing!